I ran into a folder tucked away in a box that’s moved with me from place to place over the years without having been opened more than a couple of times. I’ve been on a mission to scan all kinds of childhood artifacts to rid myself of the burden of the all the paper originals. This folder contained some of my favorites so when I saw it, I moved it to the front of the scanning queue. 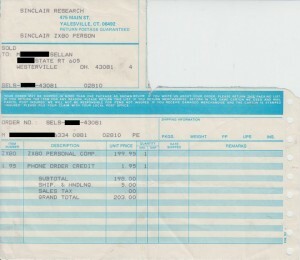 It’s all the paperwork that came with the first computer I ever owned: a Sinclair ZX80. Although the ZX80 was the first computer I ever owned, my experience with and exposure to computers came with using my school’s TRS-80s. My science teacher in high school was very forward thinking and had his own fully expanded TRS-80 Model I that included two floppy disk drives and a printer that he kept at the school. Additionally, there were five or six other basically equipped Model I computers (4k level 1 I think) for use by the students. As a part of freshman science we had to learn the rudimentary aspects of computer programming. He taught us how to program in BASIC and everyone in class had to write a Russian Roulette program. I was hooked. I couldn’t get enough time with them. Not only did I write the Russian Roulette program, I wrote a graphics routine that started the game by displaying a clunky set of blocks in the shape of a gun along with another block that moved across the screen from the gun to represent the “bullet”. For me, it was the beginning of using the computer to present all kinds of schoolwork. Unfortunately, I didn’t have enough time at school to work on programs but also didn’t have enough money to buy my own TRS-80. 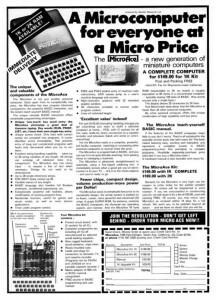 So one day in late 1980 while flipping through a Popular Electronics magazine (I was a teen subscriber) I saw an ad for a kit computer called the MicroAce. It was $149.95. That was still a lot of money for me but was also the closest computer I could imagine being able to buy given that all the other computers of the day were at least $299 with most being $600 or more. Plus, it came as a kit and I thought that would be fun. I was just starting to learn about electronics, electronic components and circuits, how to solder, and how to etch circuit boards, so it seemed like a good project. MicroAce even advertised that if you couldn’t get the computer to work after you assembled it, you could send it in to them to repair for $20.00. I started to save up to buy one. Christmas came that year and I think I asked for very little hoping that Santa would put a little cash in my stocking instead. The new year came and then Sinclair did some thing that changed the game for me. 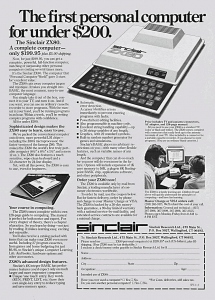 They too had been advertising the ZX80 in Popular Electronics towards the end of 1980. But their ad, like the MicroAce, was black and white but unlike the MicroAce it didn’t do much to hook me. In black and white, the MicroAce was a much nicer looking machine. So I had pretty much ignored the Sinclair. 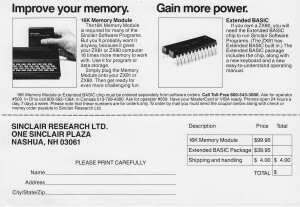 In fact, at one point on the MicroAce ad it listed “Licensed by Sinclair Research Ltd.” which to me meant I was effectively getting the Sinclair ZX80 for way less money. (Sixty dollars back then and as a kid *was* a lot of money). Interestingly, I never saw a color ad for the MicroAce. It was years later when I saw that it had a red colored keyboard which looked terrible to me. In January of 1981, my issue of Popular Electronics arrived with the usual barrage of computer advertisements for all those expensive computers from Ohio Scientific, Pet, Radio Shack, Apple, Atari, “The imagination machine” and of course Heathkit that I couldn’t afford. It also had the usual ad for the MicroAce which I would read over and over. But that month the ad for the Sinclair ad had changed – it was in full color. Wow. That really made a difference. The ZX80 with its blue keyboard white body and orange lettering was beautiful. Now I began to agonize about how to justify to myself that based merely on appearance I wanted the ZX80 more than the MicroAce and that it was going to cost me an extra fifty dollars. The size wasn’t the only thing that surprised me. Besides being little it didn’t behave anything like the TRS-80s at school. I could get past the tiny membrane keyboard – afterall Sinclair had made it possible to enter whole Basic keywords with a single key press so there was a lot less typing. And I wasn’t a typist at that point so I appreciated the single keyword entry. But every time I pressed a key the screen would flicker. And when I ran a program the display would disappear entirely. I had learned how to use character graphics with the TRS-80s to make little interactive games. But when I converted these programs to run on the ZX80 there was no animation; only the final output displayed at the end of the program run. I was totally confused. The difference was interesting. I must have originally received an early American market issue one unit. 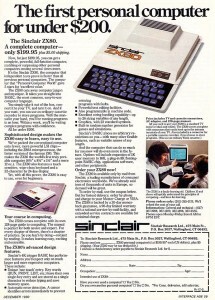 It had a thinner case with rounded edges on the top case and a shiny keyboard membrane, (like the one shown – left) as depicted in the ads from early ’81. The second, replacement ZX80 I received looked sturdier and had a slightly thicker case with squared edges on the top case and a matt finish keyboard membrane. I could tell this replacement was “better” in the sense of being more durable, but I really liked that first model with the softer edges better. But there wasn’t anything else to do so I made the best of it and kept it and continued to learn to program in Basic. I had also noticed in those ads from early ’81 that Sinclair was coming out with expansion options. A new 8k BASIC interpreter, a 16k RAM upgrade and a printer. So I was looking forward to those upgrades. At least for the memory. Learning to progra m in 1k of RAM even then was a challenge. 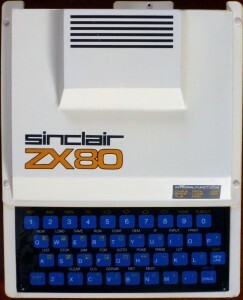 I was starting to learn Z80 assembly at school mostly because it was the cool thing to do at the time as the TRS-80 also used the Zilog Z80 processor but also because I realized that the only way to get an interactive display with the ZX80 would be through machine language. 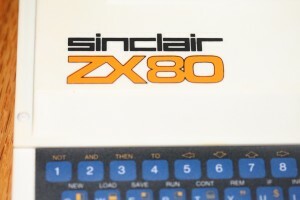 It wasn ‘t long after that that Sinclair announced the ZX81 as the successor to the ZX80. I was massively disappointed. It had been completely redesigned appearance-wise. It was a sleeker black case with small raised red lettering and a keyboard membrane that was black and white with red accents. It looked ok but not nearly as cool as the ZX80. On the plus side, it offered a new mode of operation called “slow” mode which was flicker free. 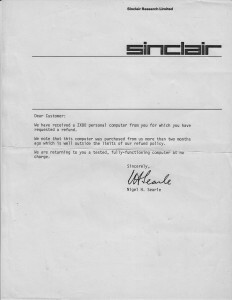 But I had just bought a ZX80 a few months before and I wasn’t going to buy another computer. I felt a little duped by Sinclair. But it seemed like a sunk cost so I decided to stick with them. The best I could do was upgrade the ROM to the 8k model to have all the functionality minus the flicker-free slow mode. Having integer BASIC had been pretty terrible so getting floating point math was a pretty important upgrade. So I waited for it to be released and saved some money for when it came out. I bought the 8k rom upgrade a few months later. It came in a plain manilla envelope (below right) along with an instruction sheet (below left) and a keyboard overlay . I was really disappointed in the overlay. That alone was almost the reason I stopped using my ZX80. 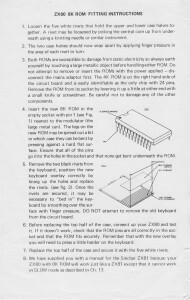 Rather than develop a keyboard overlay that added the new ROM’s functionality to the keyboard and also matched the color scheme of the original ZX80, they simply supplied overlays that were from the ZX81. The overlay didn’t fit very well on the ZX80. It slid under the top case a little on one edge and was held down by the two plastic grommets at the other edge. So it was always a little loose. It looked like some tatty add-on that wasn’t quite supposed to be there. Its red and black styling made the ZX80 look old, worn out and tired. Today we’d call it a cheap hack. Interestingly, I never installed either of them. 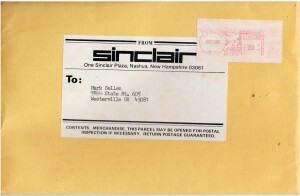 Shortly before Christmas, and before I could even open the case to install my new ROM, my ZX80 developed an issue and after calling in a couple of times to Sinclair support, they had me send it in. I hadn’t purchased the twenty-five dollar extended warranty that Sinclair offered but I learned that if you called them enough they’d relent and do something to help you out. It was the least they could do after taking my two hundred bucks without warning me about the lack of a video display. So again I packed it up in its plain cardboard box and sent it off to Sinclair to be repaired. Much to my surprise, and joyful amazement at the time, they sent back a ZX81 to replace it! I was so excited. I finally had access to “slow” mode with out having to pay anything. They didn’t charge me for the repair. They just sent me a new computer. It did extend the useful life of my Sinclair by about another six months. But in the end, I really wanted a “real” computer and bought a used TRS-80 model 1. 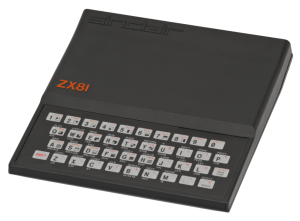 In retrospect, it would have been better if I had kept the original ZX80 as their value has stayed high over the years due to the few of them sold and having survived all this time. I picked one up about ten years ago (the one in the picture at the beginning of this article) for about $100. I still keep a small black and white TV around just for it. I also still have my original ZX81. It was an interesting time in the development of the PC. I’m glad I had the chance to experience it from the ground up.